The Federal Highway Administration's (FHWA) Office of Infrastructure Research and Development (R&D) conducts research that improves the design, construction, operation, and management of pavements and structures. Located at the Turner-Fairbank Highway Research Center (TFHRC), the office has an active outreach program that identifies future targets of opportunity, and researchers who pursue advanced initiatives that drive innovative programs to serve customers' needs. Sharing research activities and results with partners and other interested parties is very important. The Office of Infrastructure R&D "spreads the word" and engages the transportation community through publications, meetings, and the TFHRC Web site, and collaborates with State highway agencies, industry trade associations, and professional societies. Optimized Pavement Design, Materials, and Evaluation Systems. Enhanced User Satisfaction with the Driving Experience. Eight TFHRC laboratories support the Pavements R&D program. The Pavements R&D staff works with stakeholders, partners, and other FHWA offices to develop short- and long-term research, development, and technology transfer plans and projects; demonstrate new technology; conduct field trials; and address customer needs and potential benefits from new technology. Pavement Design and Performance Modeling (PDPM). Pavement Materials and Construction (PMC). These teams' products include information, tools, and technology that improve pavement safety, performance, and durability, and decrease construction time and costs. These attributes enhance user satisfaction with the Nation's pavements. The resulting pavements will be easier to maintain and more environmentally friendly. Because the teams treat pavements as a system, the resulting interaction and synergy among the teams collectively contribute to the successes achieved in each focus area. All three teams also solicit feedback from FHWA's partners and customers, and provide technical assistance that includes forensic analysis, testing, troubleshooting, and guidance. Pavement Design Analysis. The PDPM team works with the American Association of State Highway and Transportation Officials (AASHTO), the National Cooperative Highway Research Program (NCHRP), other FHWA offices, and State departments of transportation (DOT) to evaluate, validate, and calibrate the new pavement design guide developed under NCHRP Project 1-37A. The success of these activities will require a collaborative team effort. Concurrently, the PDPM team is developing additional mechanistic and mechanistic-empirical models to advance the state-of-the-art of pavement structural behavior prediction and design. For example, recent and current accelerated tests conducted at the Pavement Testing Facility (PTF) at TFHRC have enhanced our knowledge about the behavior of Superpave® asphalt mixes and concrete ultrathin whitetopping. These experiments are conducted with significant input from and cooperation with the paving industry, and provide invaluable data to verify design models. The PDPM team is also working on new pavement design concepts, including composite pavements, to optimize the use of available paving materials. In addition, the PDPM team is developing guidelines for systematically selecting optimal alternatives for repair and rehabilitation techniques, considering pavement condition, desired performance, and cost, among other factors. Quality Systems. FHWA has developed the HIPERPAVTM software system to predict the behavior of concrete pavements and avoid problems during construction (for more details, see the PMC team section). As it has evolved, HIPERPAV now includes a series of predictive models that are relevant to the behavior and performance of concrete pavements over both the short and long term. The PDPM team will be working with HIPERPAV as it relates to pavement performance and design. The PDPM manages the Computational laboratory, which includes finite element programs to analyze pavement performance. Pavement Design. The PMC team works to enhance the understanding of paving materials characteristics, behaviors, and their role in pavement performance by investigating them at scales ranging from micro to macro. The microscale involves chemical approaches to characterize and assess modified asphalt binder systems, detect asphalt antistripping agents (including lime), investigate alkali-silica reactivity (ASR), and conduct forensic investigations for our State partners. In the indoor laboratories, the PMC team has a range of activities. Under the Simulation, Imaging, and Mechanics of All Pavements (SIMAP), advanced two- and three-dimensional imaging techniques (including x-ray tomography) map the complex interaction of binders and aggregates. Image analysis identifies and quantifies behavior such as segregation, and advances the state of performance models. The PMC team has developed several key pieces of equipment used for asphalt and concrete materials testing. The FHWA Dynamic Angle ValidatorTM is used in the Superpave system to calibrate gyratory compactors. The coefficient of thermal expansion test provides a characteristic of concrete key to its behavior in concrete pavements. Several other pieces of equipment are being assessed and refined. 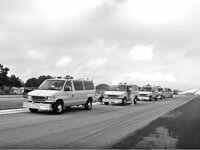 The Superpave system, developed under the Strategic Highway Research Program (SHRP), is being further refined through the efforts of the PMC team. Superpave is used nationally for asphalt binder specification and mixture design. The PMC team is conducting an indepth indoor laboratory and outdoor full-scale study into the behavior of polymer-modified binders. This effort is being coordinated through the Transportation Research Board's (TRB) Superpave Binder Expert Task Group (ETG) and the Superpave Mixture/ Aggregate ETG. At the outdoor full-scale laboratories, 12 full-scale hot-mix asphalt (HMA) test lanes using modified binders have been constructed at the PTF and are undergoing accelerated load tests. This work is part of national pooled fund project TPF-5 (019) (still open to additional State participants). Results of this study will help engineers across the country better select the asphalt binders appropriate for increasing the performance and longevity of pavements in their particular climates. User Satisfaction. To allow traffic on newly constructed pavements within days or hours after the work is completed, pavement contractors began using "fast-track" PCC mixes in the early 1990s. These mixes gain strength rapidly, thus shortening the time delay caused by pavement curing. As a result, fast-track construction improves highway user satisfaction by minimizing the delays caused by construction activities. The challenge associated with these rapid strength-gain concretes is to place them successfully to achieve long-term durability and rapid strength. In response to this problem, FHWA began researching construction guidelines for fast-track jointed plain concrete pavements. Researchers developed the software program HIPERPAV to help control pavement quality during construction. HIPERPAV uses predictive models to consider design, selection of pavement materials, construction, and environmental factors and to recommend select combinations of variables within these factors that will resist early-age distress. Research continues on HIPERPAV to expand its capabilities. Intelligent construction systems use state-of-the art technology to streamline and increase the quality of the construction process. The PMC team is currently exploring the use of smart compaction systems that incorporate a global positioning system, density sensors, and a computer graphics interface to help the roller operators optimize the compaction of base and asphalt-bound pavement layers. Quality Systems. The macroscale deals with activities that have a direct impact on the construction process. The PMC team works with the TRB's Superpave committee to develop quality assurance/ quality control guidelines for pavement construction projects. Researchers are developing and validating HMA performance-related specifications (PRS) in cooperation with NCHRP project 9-22. 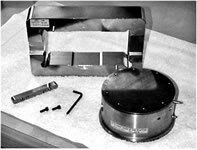 In addition, the team is exploring alternative nonnuclear devices to determine mix compaction and density during HMA construction, and evaluation of one such device is currently underway. For rigid pavements, PRS research has produced the PaveSpecTM software package that helps pavement specifiers develop their own PRS; the specifications have been tested on several projects in Indiana, with other projects pending. 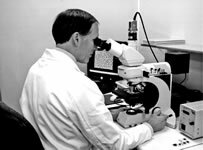 The PMC team manages the Asphalt Mixtures laboratory, Binder laboratory, Chemistry laboratory, PCC laboratory complex, Petrographic laboratory, PTF, and the SIMAP laboratory. The LTPP team conducts the LTPP program to increase the understanding of why some pavements perform better than others. This information is key to building and maintaining a cost-effective highway system. Pavement Design. 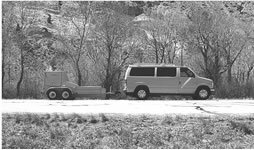 In 1987, the LTPP program-a comprehensive 20-year study of inservice pavements- began a series of rigorous long-term field experiments monitoring more than 2,400 asphalt and PCC pavement test sections across the United States and Canada. These sections included both existing pavements (General Pavement Studies) and newly constructed sections (Specific Pavement Studies). NCHRP Project 1-37A has developed a new pavement design guide. Data collected at the LTPP sites since the program's inception have been essential for evaluating and validating the models included in the new guide. LTPP data will continue to be used for further evaluation and validation of the guide. A new pooled fund study, TPF 5 (039), is being offered to interested States. Objectives of the study, "Falling Weight Deflectometer (FWD) Calibration Center and Operational Improvements," include minimizing the variability in pavement-deflection data obtained with FWDs and developing and implementing long-term plans for FWD calibration centers. User Satisfaction. The LTPP team recently completed a study of pavement smoothness index relationships to improve pavement evaluation and data comparisons. The correlations developed between Profile Indices and International Roughness Indices will allow States to convert from one system of measurement to another and still make use of archived data. The results of this study and other LTPP efforts will improve monitoring of LTPP sections and other pavements. This will lead to improved quality control during pavement construction, improved pavement performance, and, ultimately, enhanced satisfaction among highway users. Quality Systems. In addition to managing the LTPP program to its completion, the LTPP team is collecting, formatting, storing, and analyzing data on the characteristics and performance of paving materials and pavements, in support of the activities of the other two pavement teams. Work will include using new equipment and procedures to collect information, and developing a more user friendly framework to store and retrieve data, allowing easy access for multiple uses. LTPP has developed a new "Standard Data Release," which is a set of CD-ROMs containing the most current pavement performance data in zipped Microsoft® Access® 2000 database files. Also included is an application called Table Navigator, which helps the user understand the contents of the release by combining reference documents into a searchable database. A manual for Table Navigator also is included. To obtain a copy of the current Standard Data Release, please contact the LTPP Customer Support Service Center at ltppinfo@fhwa.dot.gov, by calling 865-481-2967, or by faxing 865-481-8555. DataPave Online is the latest effort to expand access to the LTPP pavement performance data while providing a user-friendly graphical interface. DataPave is available at http://www.datapave.com. The data provided in DataPave online will be the same as that delivered with the new Standard Data Release, described above; however, data updates on the Web site may lag somewhat behind the Standard Data Release as data is transferred between the two media.